This entry was substantially revised in the book, to the better (one hopes): the personal narrative got axed but there’s a more accurate and sharper analysis of the music (one hopes). Nick Drake wound up in it, and I also address the version that DB sang on with Butterfly Boucher in the early 2000s, which I find charming. As with all of these older entries, keep in mind that if you find inaccuracies, I likely corrected them in the book. I was also snarky and glib at times, which I regret. Well, sometimes. This piece now seems a remnant of a lost time, when I hadn’t figured out the voice of the blog yet. I still have no idea where Mark M. is these days. Originally posted on April 6, 2010: ch-ch-ch-Changes. Changes (A&E Live By Request, 2002). Changes (Butterfly Boucher with David Bowie, 2004). Changes (Cristin Milioti, Lazarus (fragment), 2015). I’ve seen David Bowie perform only once: Hartford, in the summer of 1990. This was the “Sound and Vision” tour, whose premise was that Bowie would be playing nothing but his hits…for the last time ever. The ultimatum caused a lot of fuss at the time, though the idea that Bowie would never sing something like “Young Americans” again for the rest of his life seemed ludicrous on its face. Bowie was back to the hits again in a few years. I also felt at odds, the passive victim of an injustice. “Changes” was Bowie’s teenage anthem, where Bowie, usually such a cold, unknowable artist, had met us halfway: “Don’t tell them to grow up and out of it!!”. Sure, part of “Changes”‘ resonance was because lines from the second verse were the preamble to The Breakfast Club (oh you know, “these children that you spit on/as they try to change their worlds…”), but the song also still sounded current, its angst unresolved. While cut the year before I was born, “Changes” didn’t feel like a hippie leftover—it wasn’t “Both Sides Now” or “Hey Jude”; it didn’t have the clammy taste of forced nostalgia (it even seemed anti-Boomer: “Where’s your shame? You’ve left us up to our necks in it!”). While it was played regularly on the radio and even my grandmother probably would have recognized it, “Changes” felt somehow as if it had sneaked through. Listening to the song 20 years later, I’m struck by how personal and how odd a track it is: “Changes” isn’t far removed from “Quicksand” in that its lyric reads like a transcribed Bowie internal monologue. The few lines Bowie offers to make the song more universal just serve as bait, in the way the song’s hooks distract the ear from its bizarre construction. “All the Young Dudes,” by comparison, is far more solid and enduring an adolescent hymn. “Changes” is something of a cuckoo’s egg. Did it matter, really? Not then, likely not now. As Levon Helm once sang, you take what you need and you leave the rest. Bowie was becoming more shrewd about his work’s commercial viability, and knew he had something with “Changes”: he led off Hunky Dory with it, chose it as his first RCA single, and made it the centerpiece of his tours (er, except Hartford ’90) and greatest-hits albums. Its lyric begins as reminiscence (Bowie recalling his career’s various false starts (“a million dead-end streets”), flops, trend-hops, self-reinventions), expands into Bowie trying to fix his current state, as if plotting a cloud’s progress on a map, and finally rewards its adolescent audience with a few identification lines. The straightforward lyric is set against a twisted harmonic backdrop (parts of the song are even “anarchic,” Wilfrid Mellers wrote [VOICE OF 2016: not really true; more in the book]). It opens with a 9-bar intro moving from Cmaj7 up to F7, and whose main hook (two of five alternating bars of piano and bass) doesn’t appear again until after the chorus, then never heard from again. (Nothing in the song is evenly-constructed: both the chorus and verses are 15 bars, while the outro (which features Bowie’s first-ever saxophone solo) is seven). Its chorus sways between 4/4, 2/4 (on “different man” or “necks in it”) and 3/4 time (starting with “time may change me”), while its chord changes are relentless (the “I can’t trace” bar has a different chord for each of three beats—C/E, G/D and F/A). Bowie makes it go down easily by layering in multiple hooks: the stuttered “changes,” or the way Trevor Bolder’s bassline, descending a half-step with each two notes, echoes the vocal harmonies, or Rick Wakeman’s piano that serves as the chorus’ rhythmic engine. This relentless strangeness, the way the song’s structure seems intent on upsetting the lyric, and yet weaves everything together to form one of Bowie’s more melodic choruses, may lie at the root of why “Changes” has never quite become a classic rock warhorse. It promises, it flatters, it offers you back your own thoughts, but the song remains unknowable. It seems to be speaking to you, but is instead conversing with the mirror. It recreates its listeners in its own image, casts them off, reclaims them. The studio demo (with Mick Ronson singing harmonies) and the LP cut are from June-August 1971, while “Changes” was released as Bowie’s first RCA single in January 1972 (RCA 2160). While it initially flopped both in the UK and the US, “Changes” would eventually become Bowie’s official theme song. How many TV rock retrospectives have featured a montage of Bowie, cutting from Ziggy to Soul Bowie to Thin White Duke to “Modern Love” Lothario, set to the “Changes” chorus? The literalness of it all makes you weep: look, he keeps Ch-ch-Changing! Live versions were recorded in 1972, 1973 and 1974 (the latter, from David Live, was the B-side of “Knock On Wood”), [VOICE OF 2016: and many more times, see links] while covers range from Ian McCulloch to Lindsay Lohan. The Bowie concert would be the last time Mark and I hung out, as I went off to college a few weeks later and I never saw him again. “Changes,” in its absence, was our epitaph. I went with a friend from work. It was a friendship of happenstance and convenience, one our mothers seemed to have arranged. “Mark, you like the New York Dolls—here’s the only other kid in our town who knows who they are.” Mark was two years older than I; he was cutting, brutal, handsome and drove an enormous white Ford LTD. Strangers at stoplights would challenge him to race. He once went so fast on Rt. 11, a dead-end Connecticut highway that the cops neglected, that the needle had circled around to 0 mph. Bowie was becoming more shrewd about his work’s commercial viability, and knew he had something with “Changes”: he led off Hunky Dory with it, chose it as his first RCA single, and made it the centerpiece of his tours (er, except Hartford ’90) and greatest hits albums. 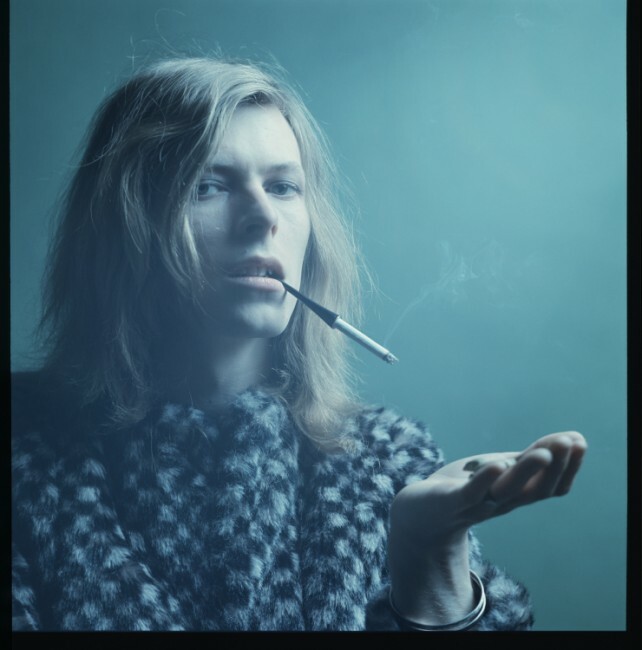 Its lyric begins as reminiscence (Bowie recalling his career’s various false starts (“a million dead-end streets”), flops, trend-hops, self-reinventions), expands into Bowie trying to fix his current state, as if plotting a cloud’s progress on a map, and finally rewards its adolescent audience with a few identification lines. The straightforward lyric is set against a twisted harmonic backdrop (parts of the song are even “anarchic,” Wilfrid Mellers wrote). It opens with a 9-bar intro moving from Cmaj7 up to F7, and whose main hook (two of five alternating bars of piano and bass) doesn’t appear again until after the chorus, then never heard from again. (Nothing in the song is evenly-constructed: both the chorus and verses are 15 bars, while the outro (which features Bowie’s first-ever saxophone solo) is seven). Its chorus sways between 4/4, 2/4 (on “different man” or “necks in it”) and 3/4 time (starting with “time may change me”), while its chord changes are relentless (the “I can’t trace” bar has a different chord for each of three beats—C/E, G/D and F/A). Bowie makes it go down easily by layering in multiple hooks: the stuttered “changes,” or the way Trevor Bolder’s bassline, descending a half-step with each two notes, echoes the vocal harmonies, or Rick Wakeman’s eight-to-the-bar piano that serves as the chorus’ rhythmic engine. The studio demo (with Mick Ronson singing harmonies) and the LP cut are from June-August 1971, while “Changes” was released as Bowie’s first RCA single in January 1972 (RCA 2160). 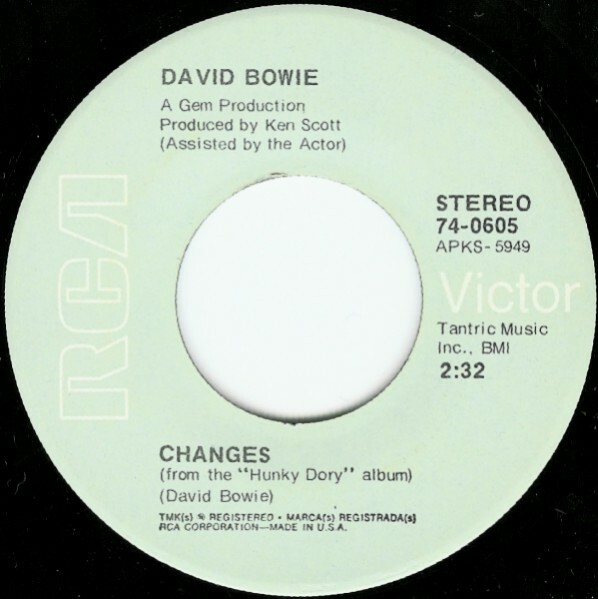 While it initially flopped both in the UK and the US, “Changes” would eventually become something of Bowie’s official theme song. How many TV rock retrospectives have featured a montage of Bowie, cutting from Ziggy to Soul Bowie to Thin White Duke to “Modern Love” Lothario, set to the “Changes” chorus? The literalness of it all makes you weep: look, he keeps Ch-ch-Changing! Live versions were recorded in 1972, 1973 and 1974 (the latter, from David Live, was the B-side of “Knock On Wood”), while covers range from Ian McCullough to Lindsay Lohan.